Pirate Ship Higemaru is an action/puzzle arcade game released by Capcom in 1984. The arcade version was only released in Japan. The game plays very much like a spiritual successor to Pengo. 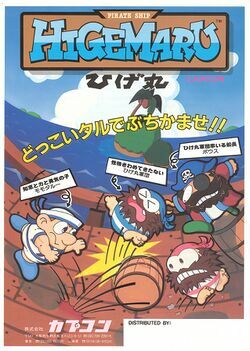 Pirate Ship Higemaru was the third game produced by Capcom, following Vulgus and SonSon. It was one of five Capcom games to use Z80-based technology, along with Vulgus, SonSon, 1942, and Exed Exes. The Yashichi, an item that frequently appears in early Capcom games, makes its second cameo appearance here. This is also the second game in which it appears as an item, following Sonson. Prior to this, it had appeared as an enemy in Vulgus. The player controls a Japanese sailor by the name of Momotaro, who must use barrels to defeat the titular pirate crew. Momotaro has the ability to grab barrels and various other items which he can throw across the screen. Any pirate who stands in the way of a barrel or other object will be hurled off the screen. Every floor of the ship has a set number of pirates to be destroyed, as well as a single "Bow", a special pirate that regenerates each time it is defeated. With each successive floor, the speed and intelligence of the pirates increases. Momotaro's enemies do not have attacks, but a single touch from an enemy will cause him to lose a life. When Momotaro has no extra lives left, the game is over. The game was included as part of Capcom Generation 3, released for the Sega Saturn and Sony PlayStation, which was also never released outside of Japan. Twenty-one years after its initial release, gamers in the United States and Europe received the game as part of Capcom Classics Collection for the PlayStation 2 and Xbox consoles, and Capcom Classics Collection Reloaded for the PlayStation Portable. This page was last edited on 13 July 2009, at 02:32.